Salvador Felipe Jacinto Dali I Domenech was born at 8:45 on the morning of May 11, 1904 in the small agricultural town of Figueres, Spain. Figueres is located in the foothills of the Pyrenees, only sixteen miles from the French border in the principality of Catalonia. The son of a prosperous notary, Dali spent his boyhood in Figueres and at the family’s summer home in the coastal fishing village of Cadaques where his parents built his first studio. As an adult, he made his home with his wife Gala in nearby Port Lligat. Many of his paintings reflect his love of this area of Spain. The young Dali attended the San Fernando Academy of Fine Arts in Madrid. Early recognition of Dali’s talent came with his first one-man show in Barcelona in 1925. He became internationally known when three of his paintings, including The Basket of Bread (now in the Museum’s collection), were shown in the third annual Carnegie International Exhibition in Pittsburgh in 1928. The following year, Dali held his first one-man show in Paris. He also joined the surrealists, led by former Dadaist Andre Breton. That year, Dali met Gala Eluard when she visited him in Cadaques with her husband, poet Paul Eluard. She became Dali’s lover, muse, business manager, and chief inspiration. Dali soon became a leader of the Surrealist Movement. His painting, The Persistance of Memory, with the soft or melting watches is still one of the best-known surrealist works. But as the war approached, the apolitical Dali clashed with the Surrealists and was “expelled” from the surrealist group during a “trial” in 1934. He did however, exhibit works in international surrealist exhibitions throughout the decade but by 1940, Dali was moving into a new type of painting with a preoccupation with science and religion. 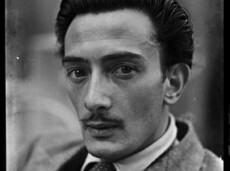 Dali and Gala escaped from Europe during World War II, spending 1940-48 in the United States. These were very important years for the artist. The Museum of Modern Art in New York gave Dali his first major retrospective exhibit in 1941. This was followed in 1942 by the publication of Dali’s autobiography, The Secret Life of Salvador Dali. As Dali moved away from Surrealism and into his classic period, he began his series of 19 large canvases, many concerning scientific, historical or religious themes. Among the best known of these works are The Hallucinogenic Toreador, and The Discovery of America by Christopher Columbus in the museum’s collection, and The Sacrament of the Last Supper in the collection of the National Gallery in Washington, D.C. In 1974, Dali opened the Teatro Museo in Figueres, Spain. This was followed by retrospectives in Paris and London at the end of the decade. After the death of his wife, Gala in 1982, Dali’s health began to fail. It deteriorated further after he was burned in a fire in his home in Pubol in 1984. Two years later, a pace-maker was implanted. Much of this part of his life was spent in seclusion, first in Pubol and later in his apartments at Torre Galatea, adjacent to the Teatro Museo. Salvador Dali died on January 23, 1989 in Figueres from heart failure with respiratory complications. Whether working from pure inspiration or on a commissioned illustration, Dali’s matchless insight and symbolic complexity are apparent. Above all, Dali was a superb draftsman. His excellence as a creative artist will always set a standard for the art of the twentieth century.